The apartment is very close to the main station and Lenka was extremely helpful. She took care of the tiniest requirements. Allowed us an early checkin and luggage storage room was provided after checkout. She also stocked the room with light breakfast so you dont have to go down for breaksfast as well. Will come back again! 도보로 이용 가능한 브르노에서 숙소 위치도 적당했고 숙소가 매우 깔끔하고 편리했다. 그리고 우리를 위한 세심한 배려가 느껴져 감사했다. + That’s a good deal in Brno. I will definitely stay there when I next time come to Brno; and I have been to Brno a million times, so, I know what I’m talking about. Very comfortable apartment, you’ve got all you need, and it is cozy and nice. The apartment is well situated, and there’s a comfortable garage in one or two minutes walk (this is a rare benefit in the city center, although it is also safe to park outside). The host is just great, very helpful and nice. – Everything was great, nothing to complain. Don’t think twice, take it. Много модерен и стилен апартамент с всички удобства. Extremly clean appartment with modern design . Great place to stay in Brno! + Central location close to all bus and rail network. Apartment came fully kitted out with all amenities needed including a washer drier. In addition the apartment manager met us personally and provided an overview of the city and its tourist attractions. -Nothing it was all perfect. + S ubytováním a komunikací s pí Lenkou jsme byli max. spokojeni a doporučujeme všem. Nice new appartment, but I do not book again. I will in the future only book appartments when it is really needed. So many different issues. The appartment owner are very kind, but I book a 3 person appartment, but when I was comming alone, all extra bed linnen and towels were removed. So, it seemed empty and cold. I always book double rooms to have plenty if towels etc. 1 small and one bigger, with no change, for a business trip like this is not enough. The owner was kind, there was milk and breakfast, but, it is not acomendation for me in the future. It might appeal to holiday visitors. Dear J. I feel very sorry our apartment didn’t meet your expectations. Yes, it’s true your apartment which you booked was for 3 persons but your reservation was for 1 person so we prepared all for only one. I’m afraid we usually dont change towels during 2 days stay (only on request). We try to approach the environment and change towels and mat one per 3-4days. We don’t offer breakfast in our apartments. But our customers find in apart something small for first moment (cereals, ginger bread and biscuits, coffee and tea). I wish you good luck! + Nagyon szép, igényes szállásunk volt, fullosan felszerelt. Direkt olyat kerestem, amiben van hűtő, mikró is, mert előre főztem és azt vittük magunkkal. Itt még egy Nespresso kávéfőző is volt, kapszulákkal. Szuper helyen volt, egy új építésű lakóházban, nyugis környéken, a belváros kb 5 perc volt onnan gyalog, a vasútállomás is 10 perc alatt elérhető. A szállásadó nagyon kedves és készséges volt, kicsekkolás után megengedte, hogy otthagyjuk a bőröndünket egy zárt helyiségben, amíg a városban mászkáltunk. – Nem nagyon volt ilyen, egyedül annyi, hogy a hálóban lehetne más redőnyt használni, hogy sötétebb legyen. Great stay you shall never miss!! + Lenka is a great host. We have warm welcome and have a lot of nice suggestions at the first begining. Everything we need is just well prepared, and the apartment is super super clean. It’s just like home,and far beyong our expectation. Sincerely recommend!! + Příjemný prostor, výborná poloha u centra, rozsáhlá výbava. Quite location very clean and comfortable. + Spacious, comfortable apartment. Conveniently located close to the train station and to the town centre. Friendly, helpful host with lots of suggestions of places to visit. Would certainly stay again if we return to Brno. My apartment was a studio, it always seemed that wherever I looked some thought had been into an additional design touch. I arrived earlier than expected and they were perfectly accomodating. Free snacks and an equipped kitchen awaited me. I was offered advice for the area and things to do around Brno which was over the top nice! It was only a short 5 minute walk and I was amongst the people, restaurants and shops. It’s about a 10 min or less walk from the train station. Wir waren mit diesem Apartment sehr zufrieden! Sehr freundliche und hilfsbereite Gastgeberin, Perfekt sauberes und gut eingerichtetes Apartment – auch für längeren Aufenthalt gut geeignet, Küche ist gut eingerichtet, für kleines Frühstück ist gesorgt – Nespresso Kaffee, Tee, Kekse, Milch, etc., Praktische und bequeme Garage im Haus. Sehr gute Lage. Příjemné ubytovaní s příjemnou paní domácí. Skvělá lokace, všude kousek. + La posizione, il garage nello stesso palazzo, l’attrezzatura della casa completa e il terrazzino. Ottima posizione al confine con il centro pedonale per chi ha un’auto. Grande disponibilità e gentilezza di Lenka sempre pronta a risolvere qualunque problema. +понравилось абсолютно все! и хозяйка и аппартаменты! расположение, чистота, комфорт! все продумано для длительного проживания! кофе превосходный! хозяйка – выше всяких похвал, дружелюбная, гостеприимная, рассказала о всех фишках города, предусмотрела перекус с дороги, даже помогла забролнировать экскурсию в Моравский карст – очень рекомендую. рекомендую всем! лучше чем в отел! Super clean and modern apartment, well equipped and nicely located in the center of Brno. We also liked the private parking space. Lenka is a super friendly host with lots of tips and recommendations! + Apartment was fantastic n we felt it was luxurious. Lenka was amazing. Very friendly and warm. She went extra mile in bringing umbrellas to train station around mid night in pouring rain to pick us up as our flightwas diverted to Prague. She was very thougful and sweet. I certainly recommend this play. Spacious well-equipped apartment in quiet but very central location. + Perfect location, near the station and also the historic centre and castle. Spacious and very well equipped. The balcony was nice after a day’s sightseeing. Everything you need, whether a short or longer stay. They even provide coffee & milk, cereals and cakes for breakfast! Very quick communication with the host. – Nothing, it was perfect for us. Очень гостеприимная хозяйка. Всё показала и рассказала об апартаментах и о Брно. Что посмотреть и куда съездить. Апартаменты новые. Есть всё что нужно. И для готовки ( капсульная кофемашина, печенюшки, различные мюсли, сахар, соль, молоко)и в ванной комнате(шампунь, гель для душа, лосьон для тела). Очень уютная квартира. Близко к центру города. Подземный гараж. +Lenka was a great host. The balcony was a lovely space to enjoy a glass of wine in the evening. – Nothing about the apartment . Perfektní ubytování, provozovatel velmi příjemný, vše v naprostém pořádku. Το διαμέρισμα είχε τα πάντα. Sehr freundliche und hilfsbereite Vermieterin, sehr, sehr sauber, sehr zentrale Lage, Ausstattung: außergewöhnlich gut, alles vorhanden, was man in einem Apartment benötigt. This property was perfect for our trip to Brno. Lenka is the property manager and she went above and beyond to ensure our comfort. She was exceptionally knowledgeable about Brno, as well as the event we were in town for. She made everything easy. The space itself is fantastic, plenty of room, well appointed furniture, comfy bed, and great balcony space. We loved it! è stato tutto fantastico, appartamento bello pulito e confortevole. Personale disponibile e prezzo più che ottimo, e posizione perfetta per il costo. +Location was in a safe area and very close to all routes, Accommodation was spotless. Lenka and Paval were fantastic and made it very easy. – Air conditioning would be a big bonus. Make sure you validate your tram tickets after purchase as there is a very large fine if you don’t as we discovered the hard way on a 4 min tram journey we were fined €96.00. Very wrong to do this to 3 tourists visiting for the weekend. Pár minut chůze od centra i vlakového nádraží, čistý malý apartmán v novostavbě, s velmi vstřícnou majitelkou, plným servisem a mnoha příjemnými drobnostmi – připravené drobné občerstvení, v lednici vychlazené mléko a v mrazáku led (v době naší návštěvy bylo přes 30 stupňů), široká nabídla kapslí Nespresso, k tomu možnost uložit si zavazadla před ubytováním i po jeho skončení. Snad jen ochlazovač vzduchu nám chyběl, při teplotách přes 23 stupňů v noci ventilátor ani otevřená okna moc nezachrání. +Krátká vzdálenost od centra města a od zastávek MHD. Káva, čaj a sušenky zdarma k dispozici. – Mohla by být lepší vybavenost kuchyně (nádobí) a koupelny (poličky na odkládání). V obývacím pokoji byl nepraktický stolek s posuvnou skleněnou deskou (nebezpečí rozbití a úrazu). First-class host , excellent apartment !!! Thanks Lenka !!! It was an absolutely lovely apartment with all the facilities you would want, ie dishwasher, washing machine, frig and coffee machine. It was very spacious, it’s photo does not do it justice. Our host Lenka was really lovely, waiting outside in the heat for us and nothing was too much trouble for her. The apartment is located within easy reach of bus and train and plenty of eating places. Also it is not far from main square We really recommend it to anyone. Byla jsem spokojená naprosto se vším. Příjemná a klidná lokalita blízko centra. Útulný, čistý a skvěle vybavený pokoj. Bezproblémová domluva s paní majitelkou. Mohu vřele doporučit. The apartment is new, comfortable, clean and very well equipped, located in quiet area, but closed to old town. Parking. Very nice and helpful host. A very nice place near the city center. A short walk to restaurants and pubs. Very close to wine tasting. Great apartment, spotless, and excellent service from LenkaA really nicely stocked pantry for when you crave a snack. Very good place for stay. Everything super perfect. 10+ Score. +Absolutely clean flat, functional and located close to train station and old town. Our hostess was polite and friendly, she had provided us with milk and croissants for breakfast since we arrived on Sunday, and explained all Brno’s amazing offers in detail. The best apartment and hostess we have ever seen! +Хозяева, супружеская пара, несмотря на более ранний приезд, подготовили апартаменты, где были и круассаны и капсюльная кофемашина. Чисто, оплату приняли картой. Вид из окна, конечно, никакой, но это было не важно для нас. Центр, весь транспорт рядом. Очень хорошо, не стыдно порекомендовать для спокойного, качественного, безпафосного отдыха. +Huoneisto on erittäin tilava ja puhdas. Kylpyhuoneessa oli amme ja kylpytuotteita. Portaikko ja hissi olivat myös hyvin siistejä. Asunto sijaitsee rauhallisella alueella vanhankaupungin kupeessa. Sisäänkirjautuessamme saimme paljon vinkkejä alueen matkailuun. Tulimme Brnoon ”rahoittumaan” Prahan jälkeen, joten emme jaksaneet kauemmaksi lähteä. Alueella olisi paljon nähtävää ja Brnossa on ihana pikkukaupungin meininki. Voisin hyvin tulla uudestaan! – Näkymä parvekkeelta oli rähjäiselle sisäpihalle, mutta eipä siellä tullut aikaa vietettyäkään. I cannot really think of anything to complain about. It is just a 5-star place at a 3-star price! +Bezproblemova komunikace a predani klicu, moc hezky, cisty a komfortni apartman, velmi dobre vybaveny, v klidne lokalite. Byli jsme spokojeni na 100%. + uper ubytovanie. Všetko tam je pripravené na skvelú dovolenku v Brne. Čo sa nám páčilo: – skvelá poloha (10 min od stanice, hneď pri centre) – možnosť parkovania na ulici (zadarmo) alebo v garáži – pekne zariadená novostavba – bezproblémová komunikácia s majiteľom – čisté nefajčiarske izby s veľkým balkónom – možnosť platiť na mieste kartou, v hotovosti, EUR alebo CZK – vybavenie kuchyne (kávovar, kanvica, platnička, mikrovlnka, umývačka riadu) – základná výbava jedla 🙂 Určite odporúčam a verím, že sa tam raz vrátim. +El apartamento está totalmente equipado y decorado con todo tipo de detalles. Se nota que a Lenka le encanta que el viajero esté cómodo. Todos son facilidades: el quedar con ella y recoger las llaves, el poder pagar el apartamento de cualquier manera, en mano (coronas o euros), tarjeta,… Muy amable a la hora de orientarnos donde cambiar moneda, donde cenar y tomar una cervezas, donde poder comprar queso, etc… El apartamento es cómodo, céntrico, con posibilidad de garaje y muy buen equipado, incluso, tiene una máquina Nespresso para poder hacer café (cápsulas incluidas) y alimentos para desayunar (bollos, leche, cereales,…). Tiene una carpeta con todo tipo de folletos, muy trabajada y orientativa de lo que se puede hacer en Brno y alrededores. Vamos, !una joya!,… muy ajustado de precio, cerca del centro. Nos dio ganas de quedarnos una noche mas, pero nuestro plan era seguir camino a Olomouc, … Totalmente recomendable, no dudamos en aconsejarlo a cualquier viajero que pare en Brno. Muchas gracias por tus atenciones Lenka. – Tuvimos que esperar un buen rato por un error de comunicación que Lenka se disculpo de forma efusiva y sintiendo sinceramente el mal entendido. Nosotros no le dimos ninguna importancia. Ella esperó en el garaje y nosotros en el portal. Gyakorlatilag minden rendelkezésre állt az apartmanban. Nagyon jó elhelyezkedés, közel az óvároshoz. Minden szempontból első osztályú volt a szállás, nagyon kedves tulajdonos. Nemzetközi szintű szállás. 5 euróért/nap zárt teremgarázsban lehetett parkolni. + The host, Lenka, was very helpful. The apartment was clean, comfortable, quiet and a good size with a lot of sun light, which could be easily blocked, if you did not want it.. Air con efficient for a whole apartment. Location was excellent, close to public transport, main railway station and the centre of the city. We stayed 10 nights and would stay again if in Brno. Very comfort, clean apartment, with well-equipped kitchen. Very kind and helpful owner, inloved in her town (Hi, Lenka, thank you for all). Very comfort parking. Lenka is the most professional host we have come across so far. The apartment is very clean, well furnished, in a brand new condition with with little extras that just make the difference. Lenka provides plenty of information with tips to make your stay enjoyable. Definitely worth staying. Place was good with prepared breakfast, I also really enjoyed large shower. Accoglienza, disponibilità, ampi spazi e pulizia. A due passi dalla stazione e dal centro storico di Brno, siamo stati accolti dalla proprietaria con simpatia e disponibilità. Ampio appartamento dotato di tutti i comfort, silenzioso, accogliente e pulto. Siamo stati informati sulle principali possibilità turistiche e ristorative di Brno, in base alle nostre necessità, con mappe e depliant. In generale un’impressione molto positiva anche in base al prezzo contenuto. Se dovessimo ritornare crecheremmo sicuramente di fare il bis. + Centralt, men ändå lugnt läge. Mycket fräsch och modern lägenhet med alla faciliteter man kan önska, dessutom utomordentligt välstädad. Hiss från garaget upp till lägenheten. Mycket trevligt välkomnande av Lenka, som gav oss ypperlig information om vad som är värt att se i Brno med omnejd. Vi kommer gärna tillbaka! – Möjligtvis hade man kunnat önska sig en roligare utsikt från den lilla balkongen. + Vše – 100%ní spokojenost. Excellent location, friendly owner, clean and well equipped rooms. + Соответствуют описанию. Это отличное место. Тихо и в двух шагах от туристического центра города. Нас доброжелательно и вовремя приняли. Все показали, выдали Карты города и окрестностей. Отметили все интересные места с краткой характеристикой. Мы даже пожалели, что приехали ненадолго. Можно смело отправляться на неделю. Будет чем заняться. Хочется отметить исключительную чистоту. Огромное спасибо Ленке за приём. Πολύ καλή περιοχή, πολύ κοντά στο κέντρο. Πολύ προσεγμένη διακόσμηση. Αστραφτερή καθαριότητα. Πολύ ευγενική οικοδέσποινα. μας είχε αφήσει ένα σωρό κρουασάν, μπισκότα , corn flakes, γάλα, ακόμα και άπειρες κάψουλες nespresso. Άνετο κρεβάτι, πλήρως εξοπλισμένο διαμέρισμα, λειτουργικότατο μπάνιο με όλα τα απαραίτητα. Το συνιστώ ανεπιφύλακτα! lenka was amazing. great communication. met me at front door and explained everything about the apartment. answered all my questions about brno and transportation. apt was well appointed, clean, convenient. nothing was lacking. perfect accommodations. Great location in Brno. Just 10 min walk from rail station. Furniture and amenities are close to brand new. + Lenka (a szállásadó) kedvessége és segítőkészsége. Tágas, tiszta, jól felszerelt, kényelmes volt a szállás. Jó volt az elhelyezkedése – közel volt a pályaudvar, a helyi tömegközlekedés, a vásárlás is könnyen megoldható volt. well kept appartment with an excellent location: the trade fair, the station and the old town are all easily accesible by foot. Lenka and Pavel were very helpful and friendly, i had some extra luggage coming and they went out of their way to make everything go smoothly. Lenka is a very gracious host. The apartment was on the ground floor, very clean, fully equipped abd the beds comfortable. Lenka arranged for trash dispoal and the apartment also included toiletries as well as basic breakfast goods, including coffee and tea, which was a welcome surprise. The apartment also possesses a charming balcony. The location was very convenient and a few meters away from a public lift that saves you a considerable uphill walk when visiting the city center. On the down side, all three beds were in the same room, which I didn’t expect, and the wi fi could use some improvement as it would frequently fizzle out. EEL apartments feel like home. Because of Lenka and Paul, I always look forward to my trips to Brno. I will be back again and again and again! Kitchen was very well equipped. Everything you need, you find there: sugar, milk, biscuits…we loved coffee. Very clean apartment, perfumed, new… Proprietario was amazing. Jediná vada chybějící snídaně. Ale v apartmánu je to tak. + novy byt nedaleko centra, majitelka velmi vstricna, k dispozici kavovar, v lednici mleko, susenky, musli, pracka, fen, zehlicka, zehlici prkno, nadobi atd. It’s a perfect place to stay there and discover Brno and Moravia from there. Everything. From Lenka to location:-). Everything. New and fully equipped flat with modern furniture and good location (Old Town, railway station, Spielberk, etc.). Lenka is extremely helpful and a real information spring:-). If you would like to spend some days in Brno and discover the town and its surroundings, it’s a pretty good choice. + Výborná poloha. Novostavba, takže všetko je nové. Vkusné a účelné zariadené. Ústretová majiteľka. – Nie je čo vytknúť. Velmi cisto, velmi pohodlne,vybavenie kuchyne plne, kupelna s vanou a prackou. Потрясающие апартаменты, в которых есть все для короткого и продолжительного отдыха в Брно. Очень удобная парковка. Спасибо встречавшей нас Ленке за информацию о городе. Все замечательно. Apartament foarte curat, dotat cu toate utilitatile, situat la 1 minut de mers pe jos de centru. Gazda extrem de amabila, ne-a pus la dispozitie harti si pliante ale orasului Brno. Ne-a explicat ce se poate vizita in oras si imprejurimi si a raspuns rapid tuturor solicitarilor noastre. Ačkoliv bylo uvedeno ubytování bez snídaně, v kuchyni byly cereálie, mléko a několik sušenek. Krásný, nový a čistý apartmán. Velice milá a ochotná hostitelka, která nám při příjezdu předala vyčerpávající informace o všem, o čem jsme potřebovaly. Personally the best experience I have ever had with AirBnb: it made me really feel good at not having chosen a more expensive solution, as a hotel. It is definitey worth the price!! Ubytovala jsem se v tomto apartmánu již po druhé, a ráda přijedu i potřetí 🙂 Místo je prostě sympatické svou jednoduchostí a zároveň detaily. V nenápadnosti zde najdete vše, od komplet zázemí v koupelně (včetně fénu a potřeb) až po kapesníčky v kuchyni. Nesspresso už dolaďuje výborný dojem, stejně tak něco k zakousnutí alá nouzovka ve skříni. Je zde dostatek ticha a nerušeného zázemí ať už v “ložnici” či v obýváku nebo u stolečku při kuchyňce. V rámci poměru cena/kvalita jsem naprosto spokojena. Perfect location, brand new appartment, very friendly owner, quiet, nespresso coffee, low-cost garage parking, extra clean. S ubytováním i “paní domácí” Lenkou jsme byli maximálně spokojeni. Vše proběhlo hladce a ubytování naprosto splnilo naše očekávání vzhledem, vybavením i čistotou. Můžeme jen a jen doporučit! Všechno bylo výborné. Ubytování v centru, vše v dosahu a apartmán byl nádherný. Location Sehr günstig gelegen durch Bahnhofs- und Zentrumsnähe. Trotzdem sehr ruhige Lage in kleiner Nebengasse. Zu Fuß ist die Stadt sehr gut zu erkunden. The time spent in Brno and in Lenka’s apartment was a fantastic experience! The flat is totally new, well furbished, perfectly located just a few steps away from the old town center. There’s a public lift 50 mt from the building which leads you directly to the entrance of the old town. The area is quite and tidy, the flat has a balcony with chairs and a table for a comfortable coffee break. Lenka is a great host and provided us all infos about what to see in town, including children activities and public transport tips. She answered all my emails even with last minute requests within a few minutes, always with a smile or an emoticon 🙂 She welcomed us with some nice gifts, a kitchen fully disposed with delicious cakes, coffee and tea, and a bottle of milk for our son! The apartment was very clean, with hair drier, fresh towels, shower gel, shampoo, all you need, we indeed felt being in a 4 star hotel! Highly recommended to anyone going to the lovely town of Brno, from a couple to a small family with one child. + Het appartement ligt vlakbij het centrum. Het appartement is nieuw en voorzien van alles wat je nodig hebt tijdens een vakantie. De bedden zijn comfortabel. De eigenaar spreekt goed Engels. Er is een privé parkeerplaats in de parkeergarage. A walk distance from the very center of the town. The apartment is look like brand new. A huge selection of nice coffee for free . We have been late with arriving ( 4 o’clock at the morning ) , but the host was still waiting on us (specially “THANK YOU” to your mom 🙂 ). Tres propre. lumineux. proche de LA gare. tres bien equipee. vous Pouvez y aller les yeux fermes. Překvapivě příjemné ubytování na úrovni s profesionálním přístupem pronajímatele. Toto ubytování hodnotím jako naprosto výjimečné a to hlavně kvůli tvůrčímu a profesionálnímu přístupu hostitelky Komunikace, příjezd – Domluva s hostitelkou byla bezproblémová, jasná a účelná. Je velmi vstřícná a snaží se vyhovět potřebám ubytovaných. Umožnila nám dřívější příjezd a přijala nás velmi přátelsky. Očekávala nás přesně v domluveném čase a rychle nás seznámila s bytem. Stejně tak nám poskytla doplňující informace o aktuálním dění v Brně. Vybavení ubytování – Jedná se o byt v novém moderním domě v běžné městské zástavbě s balkónem, dobře udržovaný a čistý. Místnost je zařízena účelně a pohodlně se znalostí potřeb ubytovaných. Byt je po technické stránce velmi dobře vybaven, má pěknou koupelnu a dobře vybavenou kuchyň. Dostatečně prostorný pro dva. Wifi je silná a rychlá. Všechna zařízení dobře fungovala. Okolí, doprava, nákupy, stravování – Byt se nachází ve městě. Okolí je ale klidné, bezpečné a poměrně tiché bez rušivých vlivů. V blízkosti je zastávka tramvaje. V dosahu do 10 – 15 minut pěší chůze je historické centrum města, nádraží, restaurace, velké supermarkety a další nákupní centra. Byt je vhodný pro návštěvu města i jako východiště k výletům do okolí Brna. Celkový dojem. Byli jsme velmi spokojeni a byt splňoval naše potřeby. Rádi přijedeme zase a děkujeme. Příjemná a ochotná paní provozní. Nice and clean apartment in a central location. The apatment is located a few minutes walk to the city centrum and the train station. It was new and very clean. Lenka, our host, was easy to communicate with, and always responded quickly on mail and sms. Coffee, milk, cereal and biscuits were included. The kichen were well equipped. I would prefer an extra pillow, a thinner one. Exceptionally great find in the heart of Brno! Wonderful place to stay in Brno. All the great reviews written here are accurate. Beautiful apartment, fantastic host, extremely friendly and helpful. Perfect location, in the very heart of the city. Very very clean. Coming back there? It’s not a question of if, it’s a question of when. Can’t think of anything wrong with this apartment. Excellent location within walking distance to old town and train station. Impeccably clean apartment with all modern amenities that make you feel at home. Lenka is a great host. Lenka was really helpful and a super host! The apartment was beyond our expectations and I would like to highlight the location, it was really close to everything! Thanks for the great experience! We loved our stay in the studio apartment. Paul and Lenka were wonderful & welcoming hosts. The apartment was very clean, tastefully decorated and complete with all the essentials. Excellent value for such a modern apartment so close to the city center. We appreciated the lovely hospitality and will definitely return again! Wouldnt stay anywhere else in Brno,EVER! -great location, great host, great service, super clean, completelly equiped. Appartment was very good and new and no traffic noise. Near the old town and public transport. Good communication. They provided tea, coffee, cereal etc so if you arrive late you have something to eat the next morning without having to find a shop. A nice touch. Hand held shower over the bath, ideally needs a wall mounting to make it easier to use. Proper service, clean rooms, well equiped. Right aproach of the person in checking in. Все понравилось. Для аппартаментов очень просторно и уютно, неплохая кухня, есть все необходимые принадлежности и бытовая техника, включая кондиционер. Кофе-машина Nespresso с капсулами бесплатно, что очень кстати, особенно утром. Хозяйка приветливо встретила, предоставила поддробные рекомендации по посещению города и окрестностей. Есть путеводители на разных языках, очень быстрый и хороший Wi-Fi. Собственный подземный паркинг совсем рядом (5 евро/сутки). Центр города в пешей доступности (наверх можно подняться на городском лифте), идти около 10 минут. Столько же идти до больших супермаркетов. Въезд и выезд без каких-либо проблем и задержек, по предварительной договоренности. По ощущениям, проживание нам понравилось больше, чем во многих классических отелях. Очень незначительный дискомфорт при приеме душа (нельзя принять душ стоя), но такая практика встречается и во многих отелях. Great place! Super clean and very nice apartment. We loved it and would absolutely stay here again. We also recommend paying the 5 euros for covered parking, we didn’t do that and ended up getting towed because we didn’t understand the parking signs. But Lenka was an amazing host and super helpful in everything! Highly recommend!! Apartmán sa veľmi páčil nie len mne, ale celej našej mini rodine. Radi sa sem vrátime. Ubytovanie bolo ešte krajšie než sme čakali. Pri cestovaní s bábätkom si veľmi starostlivo vyberáme miesta nášho pobytu. Prekvapil ma krásny svetlý apartmán, super vybavený a nadizajnovaný tak, že lahodil oku. Čistota bola na vysokej úrovni, takže som sa nebála nechať naše malé bábo loziť po zemi. Tiež ma potešila detská postieľka zdarma, ktorá bola čistučká a plne funkčná. Spoľahlivá garáž. A samozrejme káva 🙂 Páčilo sa mi tiež, že pani Lenka bola milá a hneď pri prvom stretnutí nás pozitívne namotivovala na pobyt v apt ale celkovo aj v meste hoci počasie bolo mizerné. Vstřícný přístup při dřívějším příjezdu na ubytování. Čisté a příjemné ubytování. Situación y lo nuevo que es. Destacar la amabilidad de los dueños, sus explicaciones de que ver en la ciudad. Son perfectos anfitriones. Un ascensor público al lado te lleva al casco antiguo. Todo queda cerca andando. Posibilidad de dejar el coche en el mismo edificio a 5€ noche. Es todo nuevo, casi a estrenar. La habitación está muy bien decorada, cama doble, cocina, mesa y un buen lavabo y ducha. Muy agradable estancia. Bez snídaně. Ale skvělá kuchyňka. Nádherný, prostorný, vkusně a účelně zařízený apartman. Za výhled do dvora majitel nemůže. A okolí je plné výhledů nádherných. Great new building in excellent condition and good supervision. op class equipment. Coffee pods and biscuit free provided. Good room fan with lighting safety unit. TV and wifi top class. Some fire separation doors appeared to be choked open for some reason? Muy acogedor el apartamento, Lenka muy bien nos informó de todo lo que podíamos ver y hace en Brno genial. Sehr gute, zentrale Lage, gleichzeitig ruhig. Sehr gute Ausstattung. Sehr gute Informationen durch die Gastgeberin Lenka. We had a great stay at this apartment. It was clean and comfortable and just as described. Perfect location for exploring the old town or taking public transport elsewhere in Brno. Wonderful host! Took the time when we checked in to tour the apartment and show us how things worked. Also gave us suggestions on local attractions and restaurants to check out. Communication was great. Apartment was centrally located an only about a 5 minute walk to get into the city center. Apartment was well stocked with some breakfast items, coffee, shampoo, and towels. Air conditioning worked well. Highly recommend! Kávovar k dispozici na pokoji. Zmínka o zajímavostech města Brna. Bellissimo appartamento grande e pulito con tutti i confort. Gentilissima Lenka che ci ha dato un sacco di consigli utili sulla città :cosa vedere, dove mangiare… Garage per la nostra moto. Vicino alla città vecchia raggiungibile in 10 min a piedi. Everything was great. Lenka is adorable and the apt is very confortable. apartman je situovany v novostavbe v centre mesta, ale v tichej lokalite. s vybavenim, ako aj s pohodlim sme boli nad mieru spokojni. tiez velmi ustretova pani Lenka nam poskytla vela cennych napadov na lokality v meste a vylety po okoli. Nem volt az árban benne a reggeli emlékezetem szerint. Ennek ellenére volt corn flakes, müzli, tej, tea, kapszulás kávét is lehetett főzni. Minden ragyogott a tisztaságtól. Az ágy kényelmes volt. Lehetett a nagy képernyős tv-n magyar adást nézni. Rövid sétára volt az apartman a belvárostól, ami nagyon szép.Sajnálom, hogy rövid volt az ott töltött idő. A Lenka nagyon kedvesen fogadott, A telefonálás után 5 percen belül már mutatta is a szállást. A parkolóért -mélygarázs- 5 eurót kellett fizetni, de egyébként a közelben nem lehetett volna sehol parkolni. The place is new and clean. Our host had taken care of everything. She met us at the address. She gave us a map of the city and marked us all the sites we were interested in. It was loaded with products – coffee, milk, cornflakes, biscuits and more. Special thanks to Lenka! We would visit again! Perfektní check in vč. informací o možnostech zábavy a poznávání ve městě. Velmi příjemná komunikace a servis. Super místo ve středu Brna s parkingem – pro služební cesty i dovolenou. Lenka is one of the best hosts as I ever has. I will always recomend this appartment for my friends! It is a super nice Appartement, very spacious for just a couple. Nice bathroom with big bath tub, bed with a wonderful mattres (we could sleep very well). Kitchen / fridge spacious, even Nespresso machine. 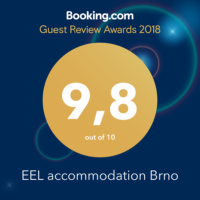 It has everything you need for a nice holiday, and Lenky, the manager, is very helpful and provides a lot of information about Brno. Old city and station, both are just a few minutes walk. Groceries, supermarkets, restaurants, cafés – everything within walking distance. We definitely enjoyed our stay. Modern, clean, bright, well-appointed kitchen, satellite channels. Great place to stay due to the proximity to historic buildings, shops, bars, and restaurants. Super clean with nice amenities. še bylo skvělé, majitelka i výbava apartmánu. Vo vybavení apartmánu bolo všetko čo človek potrebuje či už v kuchyni alebo kúpeľni. Síce nemajú recepciu alebo ubytovanie prebehlo hladko, apartmán ešte “voňal novotou” . Pekné plus bola káva v cene a aj nejaké občerstvenie na raňajky. Lokalita bola tichá a blízko centra. Určite odporúčam a ak bude možnosť určite sa vrátime. Človek by sa veľmi musel snažiť aby niečo tomuto ubytovaniu vytkol. Best place to stay in Brno! + : Host-provided breakfast items, TV with many satellite channels, everything new/clean, the host, the location. The EEL apartments are just outside of the historic old city center, a short 5 minute walk. The apartment provides all the comforts of home – kitchen (including cereal, milk, and coffee provided by the lovely host), washing machine, and flat screen TV with satellite (inc. MANY American channels), hairdryer, fluffy towels, hotel-sized soaps, and a shower with the most amazing water pressure I’ve ever experienced! The apartment and everything in it seems brand new. The host met us when we arrived and gave us her recommendations for sight-seeing. Later, we forgot the name of the restaurant she recommended and got a quick response by text message when we asked. It was comforting to know that if any issue arose, with the apartment or probably even with our visit to Brno, we had someone we could contact for help. If I get the chance to return to Brno I would really look forward to staying in an EEL apartment again. Ein neues Hotel mitten in der Altstadt von Brno. Sauberkeit, Service und der Empfang ohne Probleme, obwohl noch kräftig eingeräumt wurde. Wir können dieses Hotel nur empfehlen! Lenka was very helpful. We felt very welcomed. Would stay again 100%! We stayed in one of Lenka’s apartment of the recommendation of a friend who now lives in Brno. The apartment we had was new, spacious, very comfortable, very well set up for self catering, had reliable and fast wifi and a little balcony. Lenke was very welcoming and had stocked the apartment with tea and coffee and other basic essentials and even some things for breakfast. It’s also central to everything including the station, lots of places to eat and the old town centre. A fabulous place to stay for a few days or for months. Vše perfektní. Takto si s manželem představujeme profesionální servis v oblasti turismu. Děkujeme mockrát a těšíme se na příští pobyt. Tout : l’accueil, l’emplacement, la clarté et les commodités dans l’appartement, l’Internet, la dame nous avait laissé ce qu’il fallait pour un petit déjeuner. Das wahrscheinlich tollste Appartement im Lande. Frühstück bereits im Apartment, der Empfang zwecks Schlüsselübergbe unglaublich freundlich und herzlich. Very comfortable apartment close to trams, buses and railway station. The apartment had everything you will need. Our train was delayed but our host was able to meet us much later than we had anticipated. She was most helpful in explaining everything about Brno and the surrounding area. Krásný nový apartmán s balkonem, kuchyni, koupelnou, prackou, za cenu hotelového pokoje. Hodila by se malá lampička na nočním stolku u postele. Dichtbij trein en busstation en op loopafstand van de oude binnenstad. De inrichting van het appartement is smaakvol en van goede kwaliteit. De eigenaresse was ons zeer behulpzaam en neemt de tijd je alles uit te leggen. We konden gelijk aan de koffie met lekkere koeken . Er is ook luchthavenshuttle. The appartement was very nice, cosy and clean, and in a new building. It was fully equipped, including breakfast food (cereals, milk, etc.). The location was also a great asset, as it was close to the bus and train station, to a shopping mall as well as to the city center. In addition, the lady, who greeted us, Lenka, was really nice and helpful, and provided us with many good recommendations on what to do in Brno and its surroundings. Location. Spacious apartment. Huge bathroom. Excellent host giving many travel tips. Very clean. Everything… I loved this property and will utilize it again in future should I travel to Brno. Nothing. I loved this place. Wonderful little apartment right near the Old Town of Brno. Lenka is a fabulous host. She was super helpful – recommending great shops and restaurants, arranging taxis, and suggesting what to see in Brno. The apartment is nicely furnished and very clean. Wifi was speedy and consistent. The full size fridge made it easy to store fruits and veggies picked up at the local daily market. CZ: Již poněkolikáté jsem využil ubytování v EEL Brno Apartments. I v tomto případě bylo opět spojeno s potěšením a vynikající kvalitou. Paní majitelka je velmi ochotná a flexibilní, co se týče příjezdu a předání klíčů. Lokalita je velmi blízko samotného centra a vybavení studia je praktické a užitečné. EN: Accommodation in EEL Brno Apartments is always my first choice while in Brno and meets a the highest quality standard for this type of service. Landlord is very willing and ready to fulfill customer needs (keys handover, explanations etc.). Apartment location is very close to the city center and facility is simple and practical. Appartement neuf dans une nouvelle bâtisse. Petit mais très bien équipé. 5 min de marche (escaliers) pour atteindre le centre touristique. Très bonne accueil avec beaucoup d’informations sur les choses à visiter. Possibilité d’un stationnement dans le garage pour 5€ par nuit. Perfektni pristup, krasny, cisty apartman, mily prekvapeni v podobe snacku a kavy. Lenka je velmi ochotna a napomocna. Muzu jen doporucit! Ubytovanie na 1*. Apartman top, poloha top. Lenka bola perfeknty hostitel. Poradila a ukazala nam na prilozenej mape vsetky zaujimave miesta v Brne. Skvělé ubytování v centru města. Umístění v centru města, skvělý přístup majitelky, vynikající káva, mléko a různé sladkosti k dispozici. Walking distance (10 min) from train station. Balcony. 4th floor. Very close to the city center. Very clean. Very modern furnishings. Bed can be split for two separate small beds or pushed together for one queen size bed. Het was een mooi app. Gunstig gelegen! Volgend jaar weer! Mooi app. Gunstig gelegen bij het centrum! Was geen prullebakje in de badkamer. Ik miste een pan om vlees in te bakken en een koekepan voor een eitje in te bakken. Nice Staff, Easy walk from main train station. The owner was very kind and provided all the information about Brno. She provided all the maps and recommended best restaurants and bar. Would book this place again without even thinking. Paul was waiting for us on arrival. Lovely spotlessly clean secure open plan apartment. Modern kitchen with some breakfast foods provided if needed and a Nespresso machine which makes good coffee. Plenty of space for clothes. Very comfortable bed. Modern washing machine was a blessing after a 7 day river cruise. Walking distance to the old city attractions. Lenka was a wealth of information.The only drawback is the hand held shower in the bath. Stayed for 4 nights and would highly recommend. Čekalo nás několik příjemných překvapení: Před ubytováním nás čekala sl. Lenka s volným parkovacím místem. Prostorný, čistý a milý apartmán nemá slabé místo. V kuchyni je vynikající kávovar s kapslemi,několik druhů čajů,pochutiny k snídani a v lednici mléko a smetana. To nejpodstatnější je informační servis naší ubytovatelky, díky kterému jsme měli úžasný kulturní a gastronomický zážitek z města o kterém jsem si myslel, že jej známe. What a find! Lenka was a wonderful host who met us on arrival to let us in and provided heaps of information. The apartment was spacious and clean with comfortable beds and a large kitchen that had a Nespresso machine. We loved the internal laundry facilities. The location was perfect as it was close to the city centre and very close to the main train station. There were a number of restaurants nearby (including excellent high end ones) as well as supermarkets. I cannot recommend this place enough and I would definitely stay here again when I return. Lovely apartment in convenient area near town centre, train station and tram stops. Also 5 min walk to tescos, shopping centre or free bus to out of town shopping centre. Apartment very spacious and clean for 2 people. All mod cons including washer dryer would highly recommend. Excellent help and service from Lenka the manager. Lenka was waiting for us outside the apartment and gave us a lot of info about the area. We appreciated the breakfast items that she supplied. The apartment is very clean, very warm and about 8 mins from train station, highly recommended. Love The Czech Republic. Prague has it all… but getting off the tourist track is getting inreasingly difficult. Brno is far more laid back and, the airport is fantastically quiet. It was WAY too cold…but we visited in January. We loved the cold. The apartment is toasty.